I don’t follow a low carb or Keto diet, but I love that these movements have opened my eyes to the fact that I don’t have to eat my burger with a bun, my sandwich with bread, or my egg rolls and spring rolls with the wrapper. The carb-heavy “holders” of these foods are my least favorite part of the meal anyway, so I’m more than happy to throw a burger in a lettuce wrap and eat my egg roll out of a bowl, like with this Egg Roll Skillet. I usually use sausage in this dish because that’s what my family prefers, but ground turkey or chicken is delicious, too, not to mention lower calorie. I also usually use a bag of shredded cabbage and carrots, but you could shred your own if you like. I’ve tossed in a handful of bean sprouts to the skillet, or added some sesame seeds or fried wonton strips on top as a garnish. Some fresh cilantro would be tasty, too! 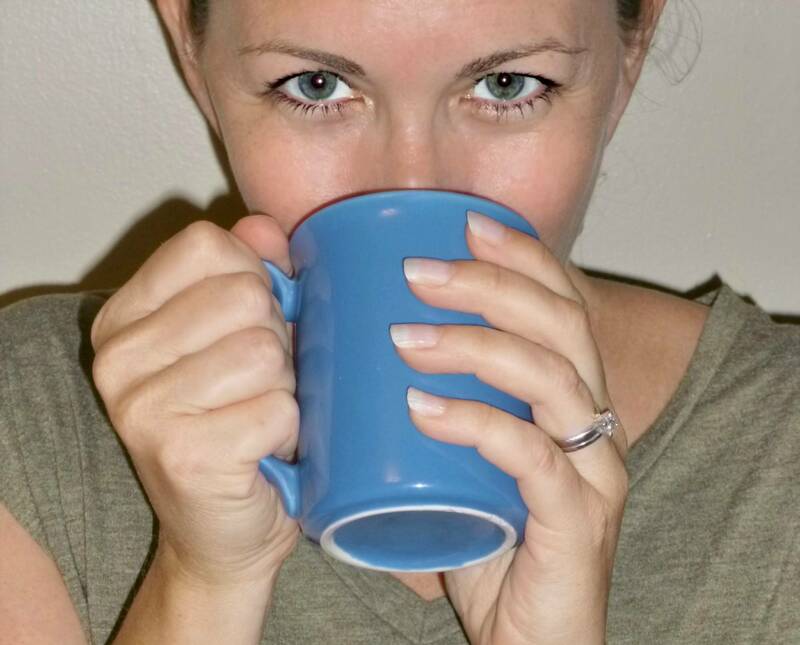 Feel free to use what you have on hand and make it your own. In a large skillet over medium heat, brown meat, stirring and crumbling, until cooked through. Drain all but one tablespoon of the sausage grease. 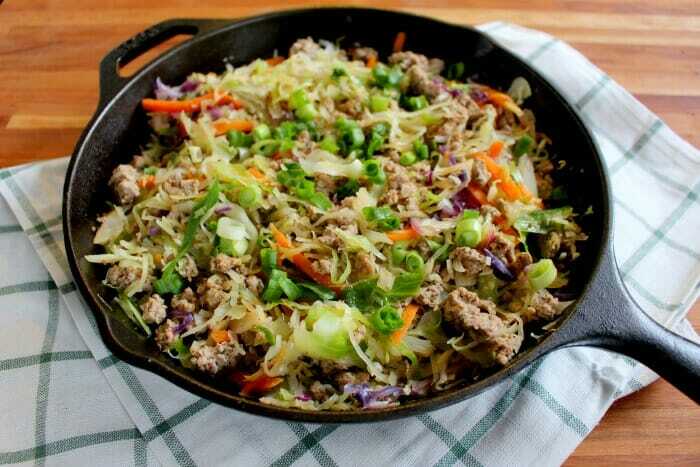 Add the cabbage and carrot mix, garlic, ginger, soy sauce, and sesame oil to the skillet with the sausage. Cook a few minutes, until cabbage has softened to desired texture. Remove from the heat and top with the green onions. Add sesame seeds or fried wonton strips, if desired. 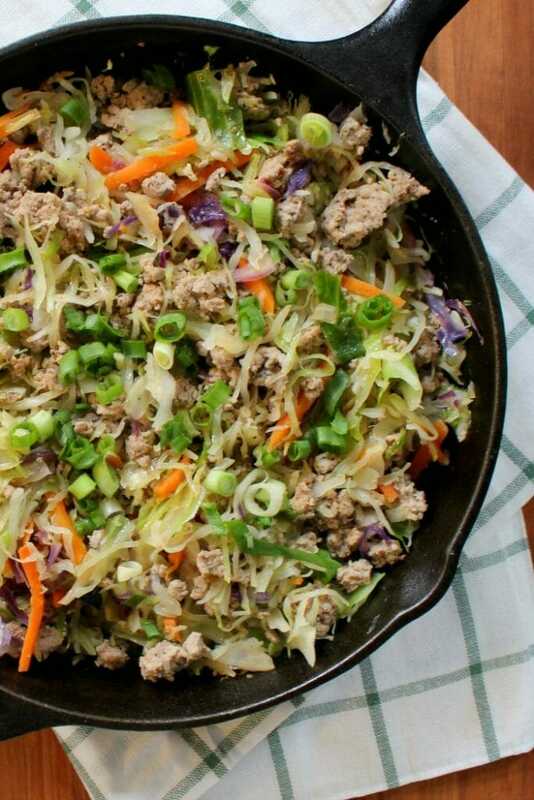 This Egg Roll Skillet a quick and easy weeknight meal that has all the flavor of your favorite appetizer without all the carbs! Add the coleslaw mix, garlic, ginger, soy sauce to the skillet with the sausage. Cook a few minutes, until cabbage has softened to desired texture.